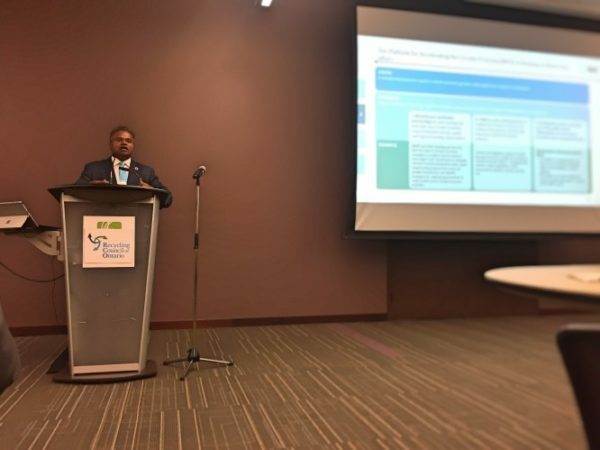 At the Beanfield Centre in Toronto Recycling Council of Ontario hosted its third and final Knowledge Sessions event for 2017. RCO’s role in advancing the circular economy is twofold. First, we want to pursue the most efficient use of resources and eliminate waste, which takes many forms, such as supporting effective policies and developing relevant resources. Second, we want to share information and knowledge amongst stakeholders to support marketplace integration, which was the spirit of our concluding workshop and forum: Procurement: Advancing the Circular Economy Through Buying Power. It is estimated that OECD countries spend 12 per cent of their GDP on public procurement. In Canada, with a 1.9 trillion dollar GDP, it spends 230 billion dollars on procurement alone. If each of one of those dollars was tied to a circular requirement we could transition the marketplace and grow wealth while simultaneously reducing environmental impacts. That’s why we organized a gathering of international experts and local professionals that are leveraging procurement opportunities to drive circular economic outcomes. Ed Rubinstein from the University Health Network (UHN) covered topics from a Customer Perspective, and shared UHN’s long-term procurement vision: to embed the use of sustainable procurement criteria, triple bottom line evaluation and life-cycle costing within UHN’s procurement, planning, and operations processes. He touched on how his department works cooperatively with other functions within his organization to ensure that CE and sustainability is given equal priorities to other product and service requirements. Ed also expanded on potential barriers to increased circularity, including safety and infection control requirements for health care products – some reprocessing is done, where cost effective and safe to do so, both within and outside of UHN. DIRTT (Doing it Right the First Time) Environmental Solutions (dirtt.net) is working to create a positive shift in the construction industry by placing as much value on the environment and people as functional design; and uses an innovative technology to create custom prefab customized interiors that virtually eliminate waste, facilitate fast lead times, and offer precise fitting and finishing. From a Design Perspective, Lynn Horricks explained how DIRTT’s digital design process offers an opportunity for users to build or adapt a space that maximizes usability and flexibility to adjust to future needs. From a Service Provider Perspective, Daniel Reshef of Canada Fibers noted some of the challenges they have seen to incorporate greater circularity: disconnect of objectives and cooperation between environment and procurement departments resulting in competing interests; not enough companies demanding recycled content; and a lack of localized decision making to support local industry. He emphasized the opportunity that the latest materials imports ban from China may afford an opportunity to support more domestic processing and remanufacturing. LouAnn Birkett, representing the Supply Chain Management Association of Canada, took the view from a Consortium Perspective, an organization of 7,000 members that helps to establish and promote standards of practice and education. LouAnn explained how the association supports a more streamlined approach, and that consortiums can work together in standardizing definitions, process, enforcement, opportunities, and be drivers of change. Members of co-operatives need to have common understanding of meaning of sustainability. Vendors need to play a role through education, and are the communication link between supply chain and end users. Chris Ferris, from the Toronto District School Board (TDSB), oversees its Purchasing and Distribution Services (PDS) department, which is responsible for buying and supplying all materials, equipment, and services for the organization. Chris explained TDSB’s procurement policy and outlined several examples of where his department has successfully integrated circular economic requirements into Request for Proposals and contracts, including lighting (through Take Back the Light), photocopiers and digital duplicators, used furniture and equipment, cleaning products, and e-waste. He underscored the importance of stakeholder engagement to a successful outcome in these areas. Judy Labelle, Advisor, Corporate Social Responsibility (CSR) and Reporting, and Laura Cocuzzi, Manager, Purchasing Planning and Performance, presented on how the Region of Peel has linked social and economic outcomes with procurement that supports environmental outcomes. By developing sustainable procurement policy they can align vendor code of conduct and performance programs with their CSR principles. 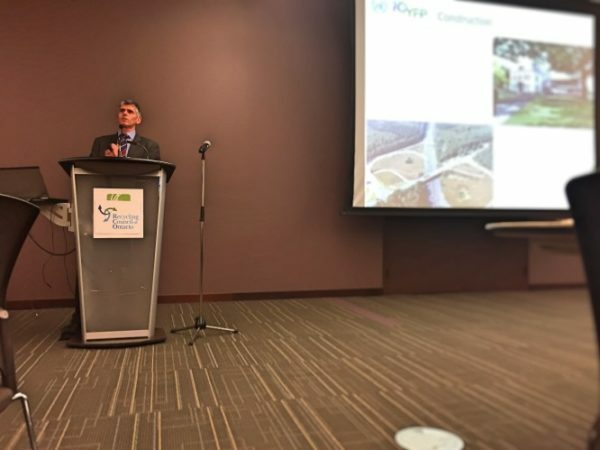 They underscored the challenges of ensuring environmental considerations and requirements are part of all aspects of municipal purchasing, and explained how their unique relationship is the basis for addressing that challenge.